Earlier this summer we introduced you to the Porsche Design bong water-pipe. Today's offering is slightly more mainstream, but just as sinful. Introducing the Johnnie Walker® Blue Label™ Collection by Porsche Design Studio. Bringing together two of the world’s most iconic and aspirational luxury brands renowned for modernity, luxury and supreme craftsmanship, the collection consists of “The Chiller” and “The Cube”, but is led by a made-to-order Johnnie Walker Blue Label Private Bar, that's it below (price is available on request, but rumored to be well north of $150,000). Back in May of 2010 I asked you what your other hobbies were besides Porsche. Like me, a number of you were partial to guns, watches and certain types of alcohol (Bourbon and Scotch). With that in mind, it should really come as no surprise to see a Porsche Designed bar. Crafted from brushed titanium with a luxurious leather interior, the bar features state of the art motion sensors to activate the opening sequence and rotate the bar through 180 degrees. 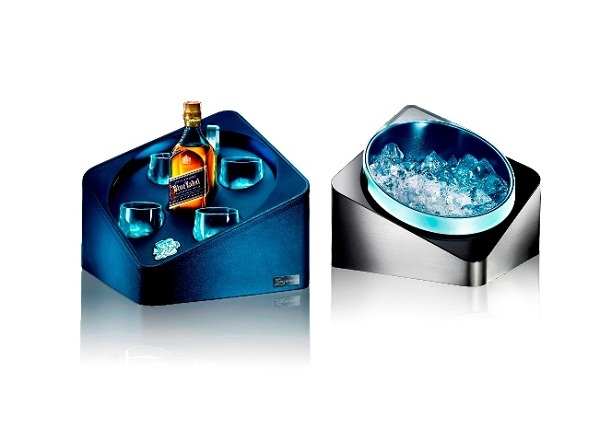 Once open three bottles of Johnnie Walker Blue present themselves on a precisely angled surface of 24 degrees (just like the the label on the bottle) along with four subtly illuminated crystal glasses and chilled water. If a made to order bar is a bit too rich for you, never fear. Johnnie Walker and Porsche Design created two other pieces for the collection. 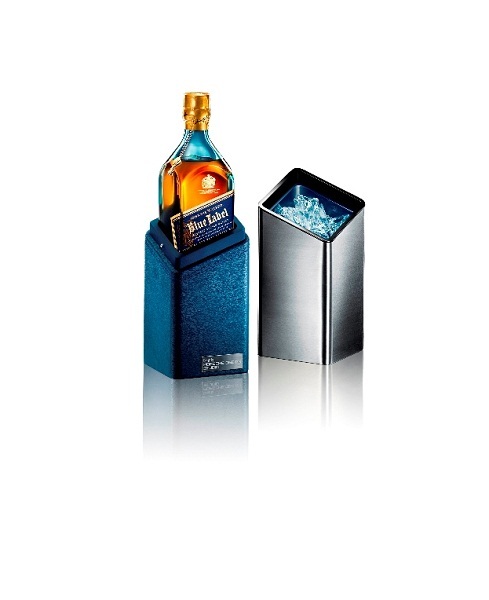 The Chiller (just shy of $500) holds a single bottle of Johnnie Walker Blue Label, encased in sophisticated dark blue leather bottom and brushed titanium top. The lightweight top removes to function as an ice chiller. The Cube (just under $1000) comes with an individually numbered bottle of Johnnie Walker Blue Label alongside an ice chiller, stainless steel tongs, and four bespoke Blue Label crystal glasses. The Chiller and the Cube will be available at Harrods, Selfridges and Harvey Nichols, and Royal Mile Whiskies from October 2011. The Private Bar is available made to order exclusively from Harrods. Let us know if you pick one up. We would love to see how this compares to the Porsche Design Shisha Water Pipe. I received a Johnie Walker Blue Chiller & Cube this Christmas, but I can’t remove the upper portion of the container to see the bottle itself. How should I do it? I feel stupid and embarrased … but that is the truth.